Q: Suppose I attack a Soldier unit with a 4/4 defense. The Stuka with the Sirens SA gets 3 successes plus an extra one for the Sirens. This would be a disruption, correct? But if I rolled four successes, the extra Siren bonus doesn't apply, yes? A: That is correct. The bonus success can be applied towards achieving a disruption result, but not a destroyed result. Q: If another unit now attacked the same target and scored enough successes to equal one hit, that unit would be destroyed, right? 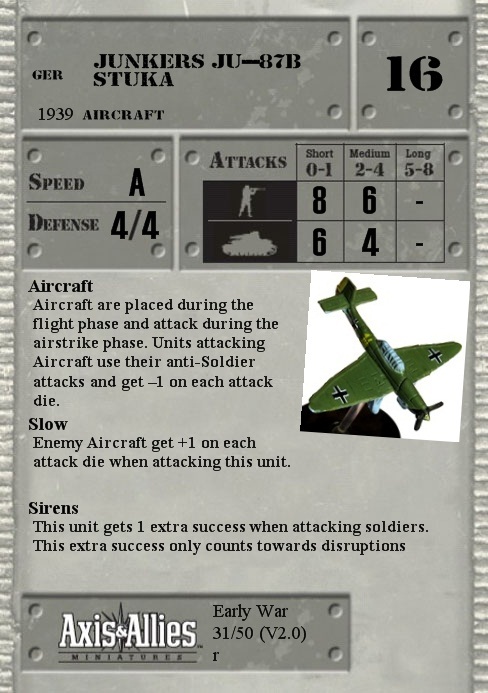 A: Yes, the Stuka achieved enough successes to get a face down disruption which is one hit. Then the second unit attacks and scores enough successes to get a second hit. Face down hits stack, so that target will be destroyed once the counters are flipped up in the casualty phase.